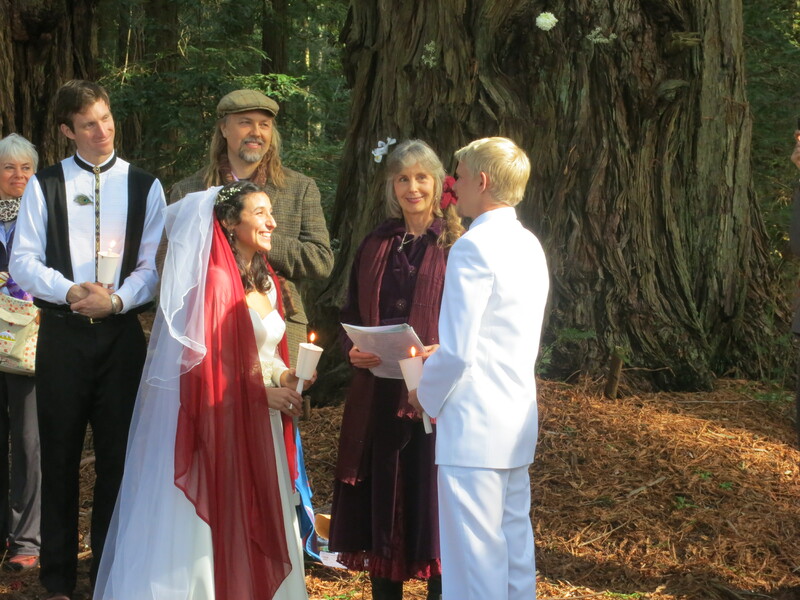 In the midst of all these myriad preparations for a Round the World trip my son, Sebastian, married his long term girlfriend Sara. I have to confess to being a little nervous about their preparations as they only had three weeks to pull it off. However, the whole day unfolded flawlessly and it was a joyous and loving occasion for everyone who attended. It took place in a Redwood Grove outside Occidental in Northern California and the weather gods were smiling, it was 70 degrees on January the 29th. We all stayed in Sebastopol the night before and set off from the hotel at about 10.00 am. The drive proved challenging as we seem to have forgotten how to read maps these days, too much reliance on technology which works fine when one can receive a signal, but when the signal fades…then what. However all was well and we didn’t let the side down by arriving late. 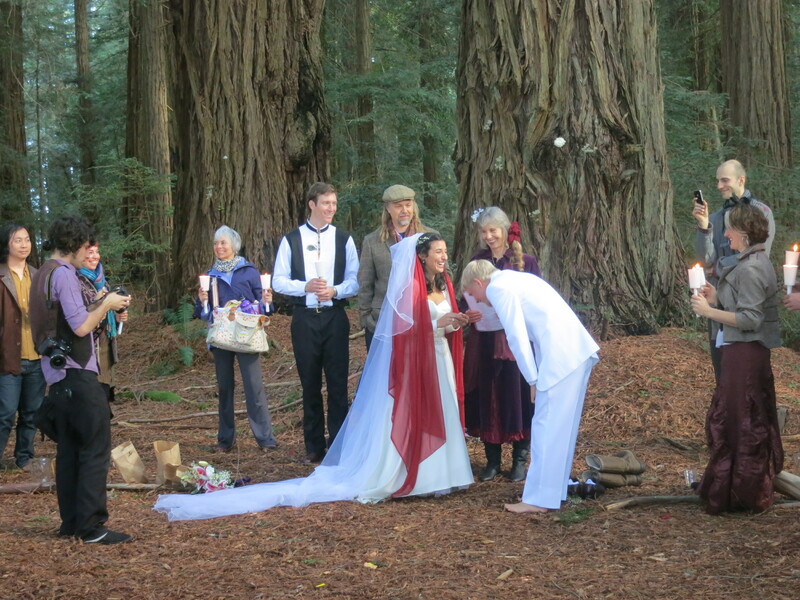 We were met in the parking lot by a well dressed “greeter” who gave us directions to the Grove and as we walked through the Redwoods we could feel our nerves dissipate. Sebastian and Sara’s helpers (aka The Crew) had prepared the Grove magnificently. 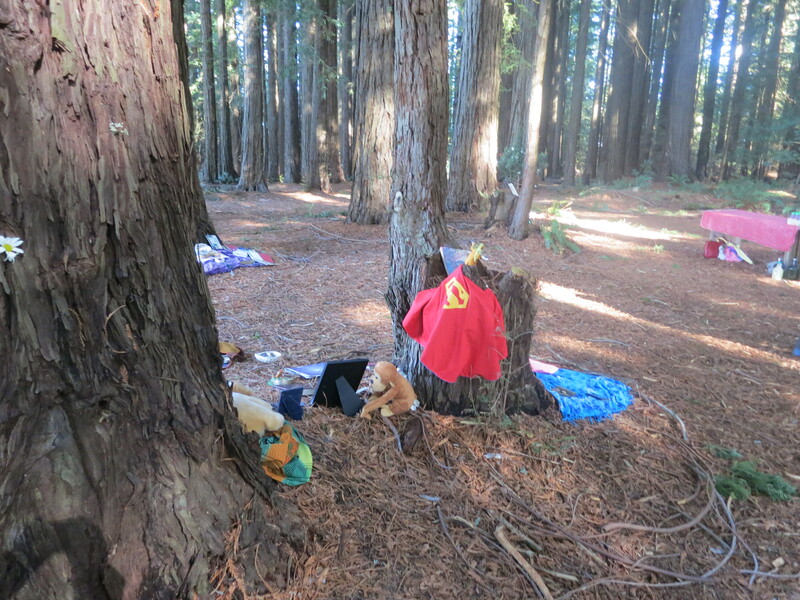 There were artifacts from each of their childhoods spread around for all to see, I was amused to see Seb’s Superman cloak from when he was five. Sara arrived through the woods on the arm of her Father and she really looked radiant. Those big eyes were like beacons of delight, and the Ceremony began. I could wax on endlessly about the candle moment, the Water moment, the smoke moment and the after party but it will suffice to know that the whole event was wonderful, I enjoyed every moment and will treasure the memory for the rest of my life. Thanks to Seb and Sara and now I have a plane to catch ! This is how I will look. Say Hi if you see me. One week to go and things seem to be falling into place. I went to a Travel Clinic last week to check what I needed in the way of shots and meds. Very pleasant and knowledgeable nurse advised me that I really only needed a Hep’ A shot so we did that and then got to talking about anti Malaria pills. The first ones she offered boasted the side effects of nightmares, hallucinations and fainting. I did not feel quite up to all that! The second batch apparently had the same side effects but without the fainting, another no. We eventually settled on Malarone, with the warning that I might suffer headaches. At $12.00 per pill I have a week’s worth and will replenish the supply before heading to Laos on February 11th. I have read that this last week is the time of the most intense and frenetic activities with a million and one things to do and, yes, I second that. So many little details to take care of. For instance, did you know that tickets for trains in India go on sale three months before the departure date ? So, yes, I have booked my ticket from Kochi to Goa. Will I get to (Snooty) Ooty? yes, but only if there are tickets available when I am ready to go. Same situation with Jaisalmer, but I really hope to get to both, amongst others. It is also the most exciting time. As my fictional friend, Dr Maturin, would say “I am with child” to see Hong Kong’s Symphony of Lights, The Mekong Delta, The Cu Chi Tunnels, the rooftop bar at the Caravelle Hotel and HaLong Bay. And that is only the first week! The Visas are coming through successfully after all my angst. 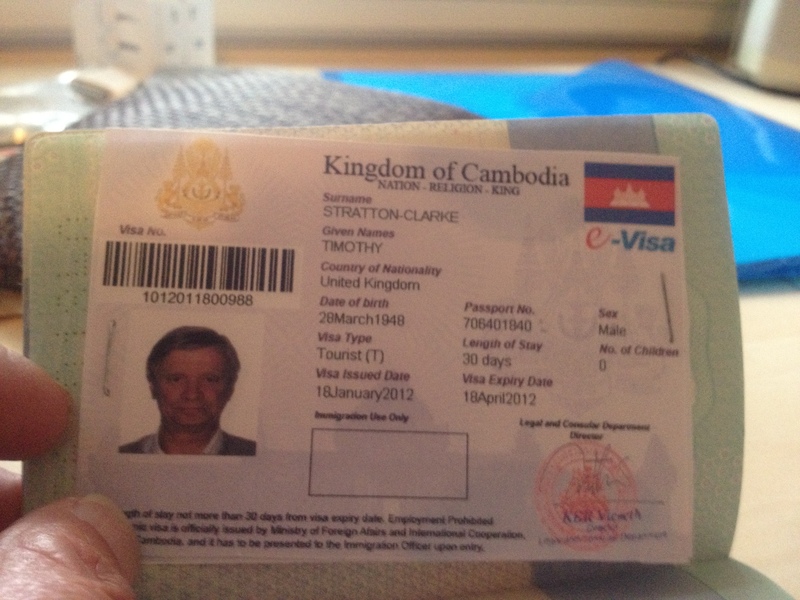 I like how Cambodia issues Visas electronically, simply fill in the online form, attach a photo.jpg, upload the lot and three days later the Visa appears in inbox to print and staple into passport. Keep it simple. A note here to the handful of you who may be reading this. I am in a kind of test phase here with this blog and really would be interested in any feedback you may have. Are the posts too long, too short, gibberish, dull or what ? Do feel free to use the comment box and don’w worry your email address remains confidential. If it looks alright I will push it out to the rest of the World next week before I leave so comment comment comment. Also of course feel free to use the “follow” button. If you were to do this you will be informed via email of any new posts from me.Thanks. The more eagle eyed of you will have noticed a reference above to the novels of Patrick O’Brian. Yes, I am reading the “Aubreyad” again. I feel that the 20 book series is just right to take on a long trip and I am already up to book #7. Of course I am reading them on the Kindle App’ on my tablet, otherwise I would have to take an extra suitcase. Never thought I would make the switch to digital books , but when I saw my Sister with her Kindle I was amazed. During the early days of e-readers she evinced a slightly Luddite view of the devices. But now she is a firm fan and is, I am sure, already loading up her device for her trip to the Ngorongoro Crater next month. It’s all in the planning ! So much planning has gone into this trip, mainly I suppose because it has been about 18 months since I first thought of it. Yes, I had originally planned to leave February 1st 2011 but the stars were not aligned right (or something) so February 1st 2012 it will be. I hit the end of year sales to buy clothes, most especially the Ex Officio line, and bought shirts and pants. They are both ultra violet and bug proof, extremely light weight and dry overnight after a hand wash. A nice lady at REI advised me on socks etc. I bought a Packsafe duffel bag to keep all my stuff in, it is quite small but converts from shoulder bag to back pack, has a grab handle and most importantly is slash proof. It has steel mesh built into the bag and straps and has a steel cable with padlock to attach to immovable objects in hotel rooms, trains, buses or wherever. Being me I have mastered what to do with the gadgets ! I bought a ScottEVest. It has some 24 pockets for all manner of things. Camera, iPod, phone, tickets, money, headphones, water bottle, keys and an iPad. (http://bit.ly/zCrruL) . I have taken it on a few trips and it works wonderfully well, especially at security gates. Older child remarked that he was dreading seeing me in it but was relieved that it actually looked “quite good”. Oh, and the sleeves are detachable. To go with it I have acquired a Grid-It which keeps all the cables, chargers, adapters and the like securely fastened with elastic to a small panel. I bought this after going on a trip to Mexico over the Christmas Holiday for a sort of test of all the above and determined that whenever I needed something I had to empty the cable bag out all over the floor. Not a good idea on a crowded train/bus/boat. I have, inevitably, had some hilarious suggestions from friends and relations on where to go, where not to go, what to do and what not to do, many of which I have taken with a pinch of salt. My Mother seems quite unfazed by the whole trip and her only concern was that I should not ride on the roof of trains ! I must tell you though that my sister suggested I call a friend in the Orkneys who did a similar trip a couple of years ago. He was most surprised when I called as we have not seen him in twenty odd years. We used to play together when I was five and he was ten ! He and his wife Steph’ sent a long letter with helpful hints, here follows an extract: ” You should go to the War Remnants Museum, it is horrific, but they are very proud of having beaten the Americans. The Ben Thanh Market is worth a look, full of fake everything and we had the best fish meal ever at the street market next door. Of course there are guide books and I am a big fan of Lonely Planet, though have spent many hours in their Forum called Thorn Tree. I have used an App called Instapaper quite considerably. On finding a useful article on the Internet you simply click save to Instapaper and you can reread it later. Create folders for whatever Country or subject and remarkably it syncs to Ipod, phone or Ipad. A most useful information collector . Is this sufficient ? Time will tell. Nerve wracking visit to the Office that issues visas for India today wondering if I had filled all the paperwork in correctly. Just completing the form online was stressful, have I got it all right. Where was my passport issued ? I don’t know and my passport doesn’t tell me. Panic. So made it up, London, though I now recollect it was renewed in LA. Its $76.00 for US citizens $77.00 for Green Card holders. Huh. Go to the passport photo shop “What size would you like your passport photos UK or US” WHAT ? Staff settled on UK size. Well OK, but will it work? Oh look, PO Box number on Driver’s License, that won’t do. Off to DMV where the line was out the door. 1st day of New Year. Fortunately knowledgeable lady knew exactly what to do and gave me a copy of my DMV record which showed Residence as well as mailing address. Will it work ? Go to Bank for required money order, showed relevant page to teller on iPad. “But it says $76.00 sir” I know I know but I have a Green Card so it is $77.00. More panic, have I got it right? So bravely head for San Francisco with Mapquest directions to 965 Mission in hand. Fabulously brilliant day on the Bay, gorgeous views from Bridge. Up and over Divisidero, left at Geary and head down town. Then. Mistake. Decided that I wanted to be on Market, so parked and set off to look for #965. Large hole where #965 should have been, then realized my panic induced error. I AM ON THE WRONG STREET. Fortunately it is only a block over to Mission and I entered office 10 minutes before my appointment time, joined queue, papers blessed by Receptionist, Money Order accepted by cashier, Visa will be Fedex’d in 5 working days. That’s it. I did it. Haha. On the way out of the office I met a chatty couple who had overheard me talking about my itinerary and asked when I would be in Goa. Seems they will be there a month before me. They were called Mr and Mrs Raver and I didn’t bat an eyelid ! 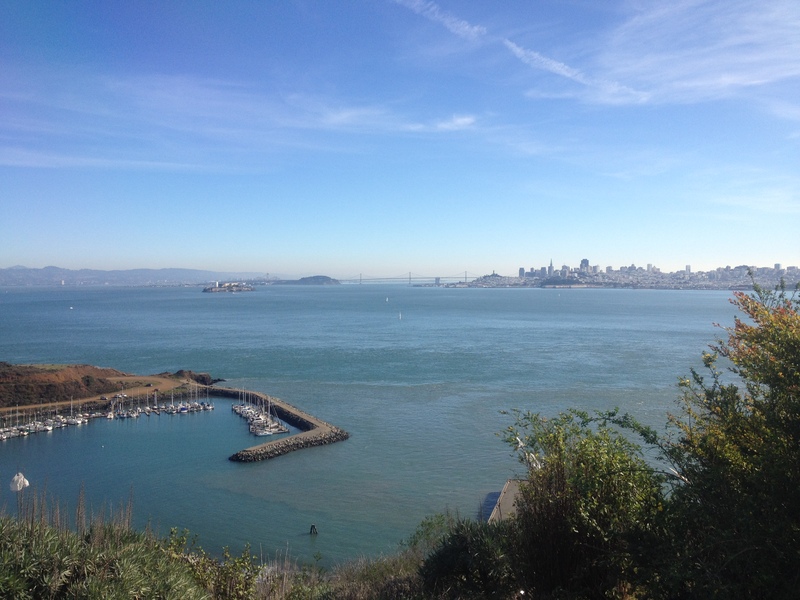 So happy with my success that I stopped by the Bridge at Vista Point and joined all the smiling tourists. It’s a new year, 2012, and here I am, a month away from launching my self around the world, watch this space for updates. February 1st fly from SFO to Hong Kong, 3 nights there and on to Saigon. Just a little apprehensive, but, hey, British, so stiff upper lip and all that. Came back from Mexico after a trial run with selected gear, shirts, pants etc and all worked as advertised. 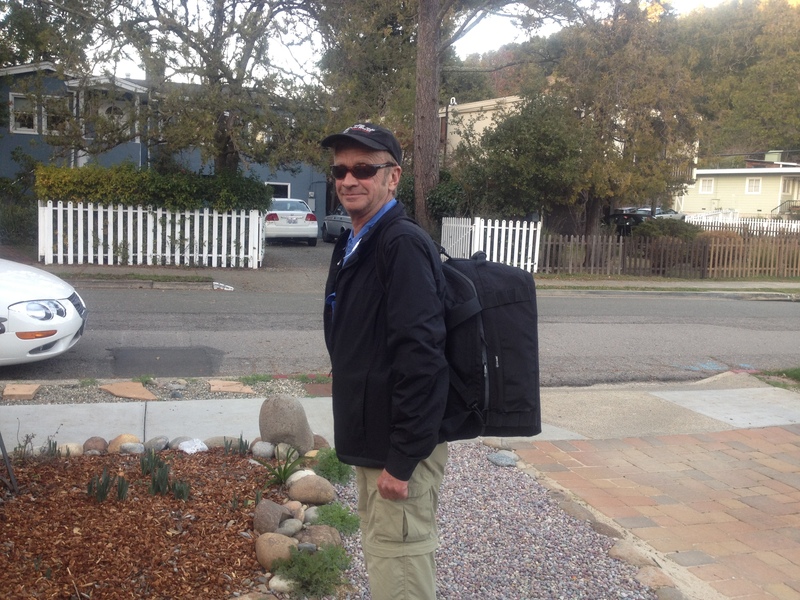 The Packsafe Duffle bag is comfortable as a backpack and holds my stuff with room to spare. Gotta love my Scott Evest, pockets for everything so I am actually wearing all my gadgets.